Legion Wargames has released a new title from Kim Kanger, this time on Burma 1944 campaign. Being both a simulation and an action-filled game, Nemesis: Burma 44 is telling a war story the way a good movie would do. The plot is about the fierce fight between the British-American (with some Chinese and Commonwealth troops) and the Japanese armies to control the northern half of Burma between March and August 1944. Operational and tactical decisions are deeply integrated in this game, since you are encouraged to relentlessly move and combat, hoping that the supply check won't come too soon. The fact is that the four phases of each turn — assault, attack, supply and reinforcement — are chosen randomly and independently of your opponent. 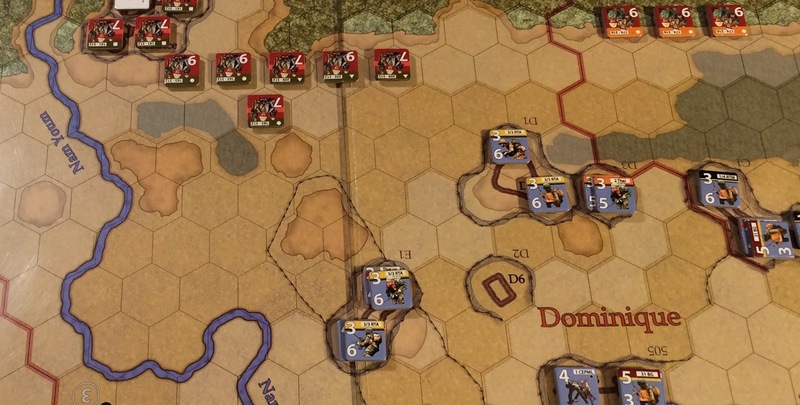 Two simple things have numerous impacts on the gameplay: the troop quality, which determines the mobility of units and their vulnerability towards supply, and the constraints of the ground (mountains and jungles), that favour light troops (mostly Japanese) and undermine motorized infantry and artillery (mostly British). 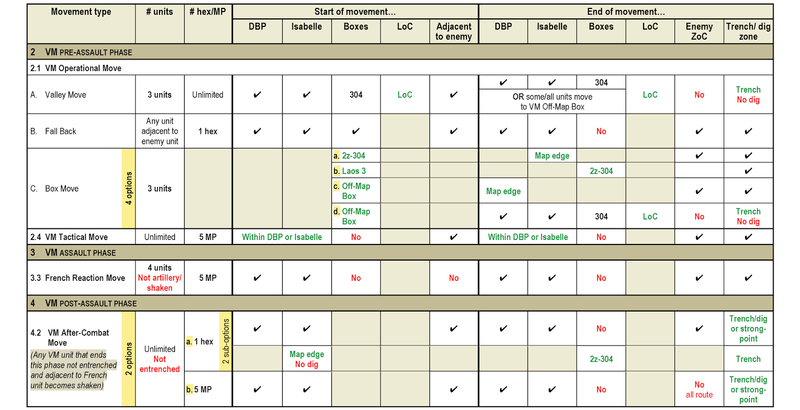 • a Unit/Transporter Attributes and Behaviour Summary, that stresses the similarities and differences between the unit types: infantry (regular or light; motorized or not), special infantry units (Chindit, local rifles, INA, Yunnan Force…) artillery (motorized or not), tanks, engineers, air support and transporters (HQs, mules and trucks). Lastly, a feature rare enough to be worthy of note, the game fits well with 4 players (2 by side), each phase being played by half of each army. 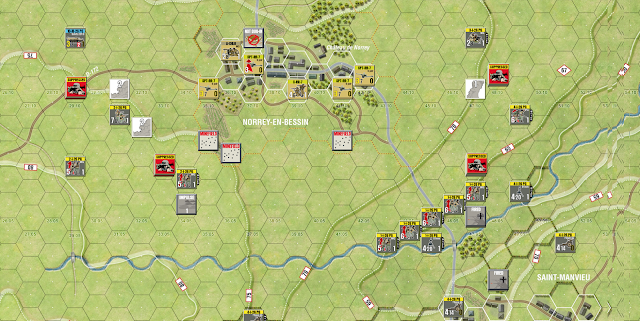 Dien Bien Phu: The Final Gamble is one of the best wargames ever made. It tells a rich story of an atypical siege of about thirty small strongpoints distributed in a "rice bowl" of 17 x 6 km. For two months, the Viet Minh bombarded, surrounded with entrenchment and sapping, and attacked French strongpoints one after the other. The designer of the game segmented the action in numerous phases relatively easy to follow, but the conditions of movement vary from case to case. This player aid shows all details to be considered when your VM of French units begin to move on the field. Use it immoderately! Published in 1982 by Columbia Games, Rommel in the Desert is not a novelty for sure. 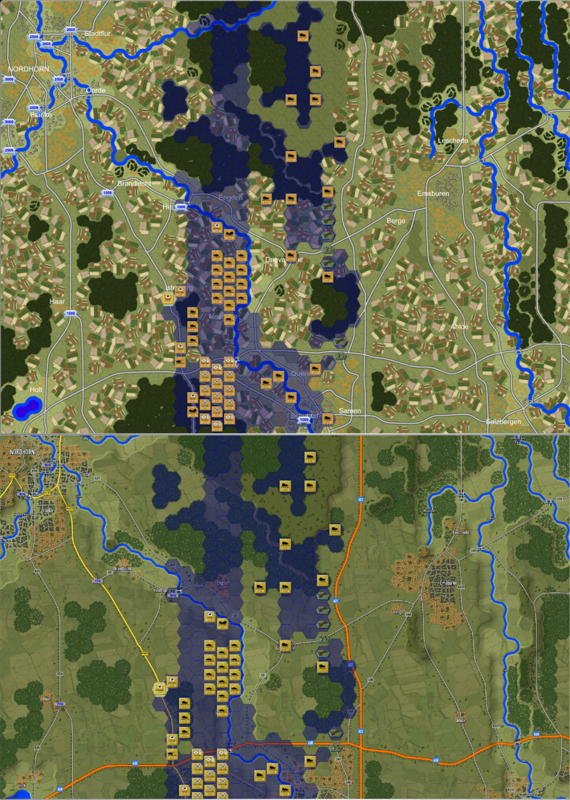 But it's still a well-designed and very coherent wargame that uses blocks to create an almost permanent fog of war. Most of scenarios can be played within a couple of hours, once the players have caught how to approach enemy units and, when needed, run away from them. This is where our player's aid comes into action. There are actually many ways to back away from the enemy during a game turn: as an under-control retreat (partial or full) after having fiercely fought the previous turn, or as an opportunistic — if not desperate — rearward movement toward a supply source. Other specifications apply when refusing a battle on the spot, or when an attack leads to a rout. Since our Retreat/Withdraw Moves Summary put all those details in a single table, it should spare you numerous searches into the rulebook. Note: An amended version (v02bis) is available since October 2017. Me and Stephane are currently learning the TCS game system, designed by The Gamers and now published by Multi-Man Publishing. This is the kind of wargame you have to study a bit before seating comfortably on saddle, to say the least. The rules take into account a whole bunch of features, such as the height of buildings and trees, the firer and target sizes, the time spent to deploy or get ready to move again, and so on. Everything is there in a way you can literally see things happening, at a slow but realistic pace. To help us remembering the subtle differences between the various units, we made a player aid sheet, called TCS Unit Characteristics, largely based on Tom Påhlsson's Unit Type Summary. 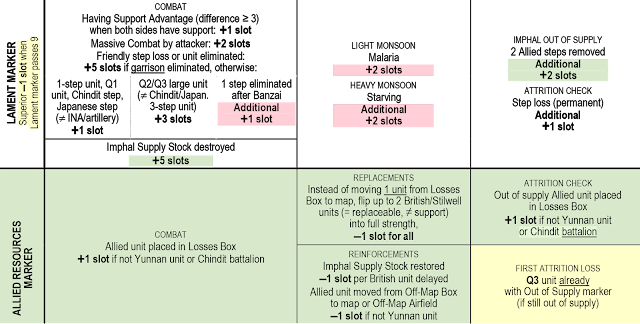 It covers the morale, spotting range, type of firing, move/fire change costs and other unit specific attributes. You should appreciate it until you get to know everything by heart. We are using this sheet a lot while playing our firtst scenario of Canadian Crucible: Brigade Fortress at Norrey, a simulation of the Canadian defense of Norrey on June 8 against the spearheaded of the 12th SS Panzer Division. 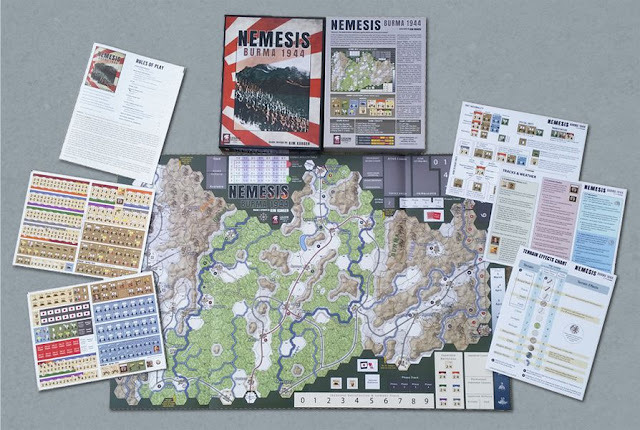 The Standard Combat Series (SCS), from Multi-Man Publishing, depicts large and mid-size battles at the operational level using quite simple mechanisms. 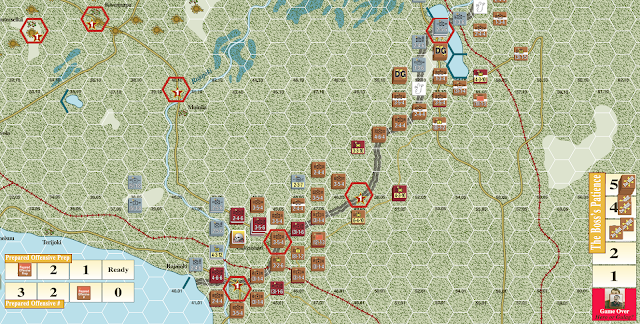 Karelia '44 belongs to the "smallest" category in the series, so it serves as a good introductory game to the SCS system. The learning curve is smooth. After you read the 8-page SCS generic rules, you continue with the similarly sized Karelia '44 game specific rules. Right after you'll be playing your first game. 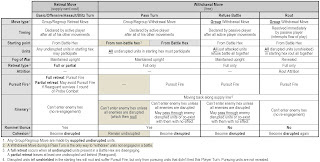 Then, after some turns, you'll notice numerous differences between each side abilities during the artillery barrage, movement and exploitation phases. 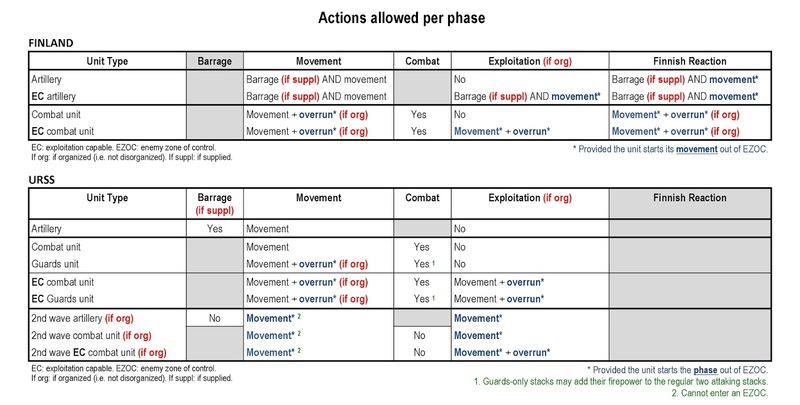 Struck by these uncertainties, Stéphane Tanguay — one of the best rules gardian — drew up a table showing the different actions allowed during each phase. This player aid will quickly become your new best friend! 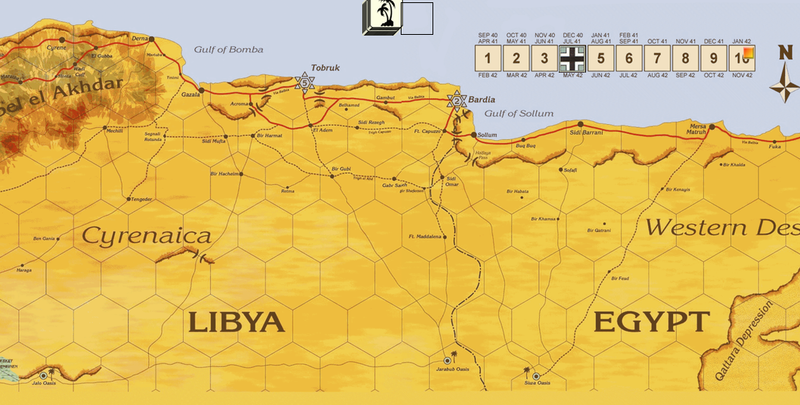 The last update of Flashpoint Campaigns: Red Storm (FCRS) gives me a good excuse to reconnect with this unique game. FCRS was first released in October 2013, but its developers wanted to give a special thanks to the fans with a Player’s Edition (published at the end of 2014) that underlines their contribution. From a strict content point of view, the Player’s Edition is just an average update, but the intent behind the release makes sense. There is some meat to sink your teeth into, with the more relevant parts being the better readability and color rendering of all maps, and more importantly the new "sudden death" setting that allows the player to continue a game beyond the normal ending threshold; this is triggered when any of the two opposing armies lose 70% of their initial strength. 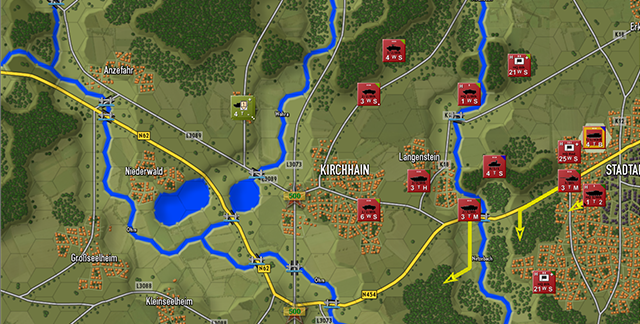 The update provides a new scenario (Eyes, Ears and Teeth) and a new campaign (Wolves) made of 10 scenarios playable from the NATO side*. Players will also notice well thought-out adjustments to the game engine and user interface, certainly enjoyable but not revolutionary. However, the essential thing is that Flashpoint Campaigns are alive and slowly but surely making their way toward maturity. This series is led by a small team that dedicates all their spare time to their baby, while maintaining a strong organic relationship with the gaming community. * The Player’s Edition includes three other new scenarios and one more campaign, designed by passionate fans, that were not in the initial game. is a lot more readable than the previous one (bottom). The Lock 'n Load tactic system seems easy to learn because everything is so concrete: I move, you fire, and we roll dice. What I find a bit hard to handle is the variety of needs that the dice are used for, and not always in the same manner. You have doubt? Take a look at the Dice Rolls player aid we drawn up, me and Stéphane Tanguay, one of the Lock 'n Load world experts. The player aid describe the dice uses in LnL Heroes of Stalingrad video game, which is about the same as in LnL Not One Step Back boardgame expansion. It shows how are obtained "hit", "shaken" and "destroyed" results, but doesn't give all the details about the dice modifiers. With its help, at least you'll understand where are going all those flying dice on the screen while playing Heroes of Stalingrad. Enjoy!